Evening & welcome to #SundayTimes. On Friday, it was Burns Day, where Scots around the world celebrated Robert Burns’ birthday by toasting the haggis. And on Friday, appropriately Andy Murray beat Roger Federer to progress to the Australian Open final. After an incredible first set this morning, unfortunately Murray was beaten by Djovokic. But there’s definitely so much more to come from Andy in 2013 and so much to be proud of. It’s times like this, that remind me why I’m so proud of my Scottish roots, so tonight’s #SundayTimes #5aday is 5 stunning Scottish places to visit, that hold significant memories for me from growing up. East Lothian – Where I grew up in a small village called Pencaitland. 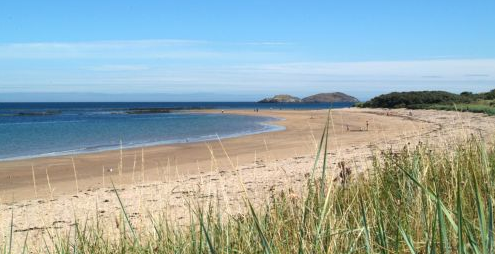 Lots of stunning beach walks (Yellowcraig pictured above) & pretty villages & towns. Edinburgh – The place of my education – both at school & in life. Read my previous #GTime about Edinburgh here. Campbeltown – Where we spent our summers visiting grandparents & now where my parents live. Read my previous #GTime about Campbeltown here. Glasgow – I enjoyed many nights out here in my younger days & one particularly memorable one with Fit Chick Tori involving the fire brigade! St Andrews – Memories from school lacrosse matches against St Leonards, visiting uni friends & working at the 2000 British Open & the 2004 Dunhill Links Championship. 5 stunning Scottish settings and reasons to visit Scotland this year. Also 2013, is the Year of Natural Scotland. Find out more from Visit Scotland’s website here.